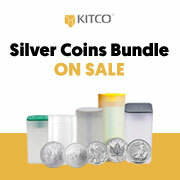 Sell platinum coins and other precious metals securely with Kitco. To sell 1/10 oz Platinum Eagle Coins, simply create a packing slip using our online store. It's easy to select your product from our product list and make your sale. If you need any help call us at 1 877 775-4826 (US and Canada) or use our international number, 1 514 313-9999. Our Customer Service Representatives will be very happy to help you to complete your transaction. Why sell 1/10 oz Platinum Eagle Coins to Kitco?